It’s game time! With everyone gearing up for the big game, I thought it was time to post a vegan, game day snack recipe. My husband and I are sticking to a plant based diet this year, so I have been elbows deep in vegan recipe books and blogs. One of the first vegan recipes that I ever made was Robin Robertson’s Mac and Chard . The “cheese” sauce has since been the inspiration for so many “cheese” sauce variations in my own cooking. 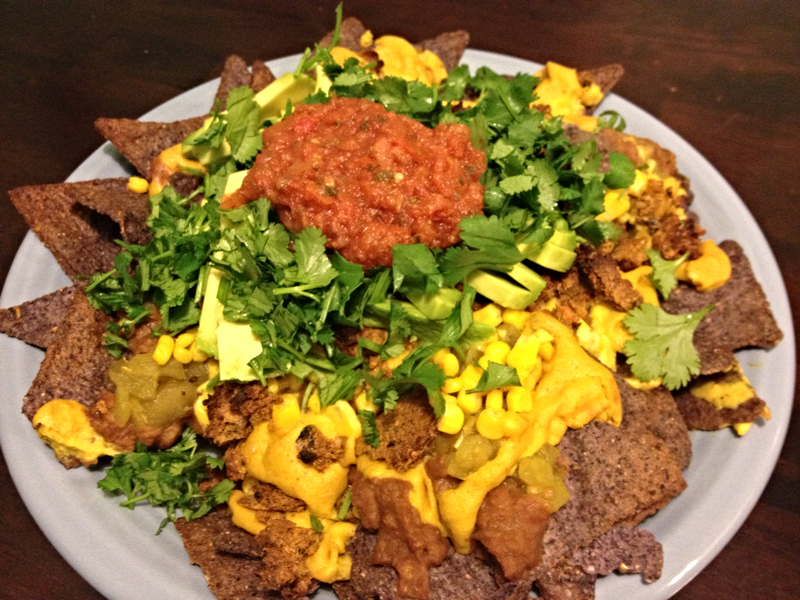 For this recipe, I used lime and cayenne pepper for a zesty vegan nacho cheese. The Loco Chipotle Sunshine Burgers work great for this recipe, but I am sure that the Black Bean Southwest Sunshine Burgers would be an awesome addition too. This is a popular party snack for vegans and non-vegans alike. My husband and I devoured a plate all on our own last weekend after a long day of watching football – delicious! This recipe serves 5 snacking people. 1 package Loco Chipotle Sunshine Burgers , cooked or defrosted per package instructions and crumbled. Place the onion and potato in a heavy bottom pan with the grapeseed oil and cook on medium heat. Add salt and garlic powder and stir frequently until onions begin to become translucent. Add the vegetable broth and bring to a simmer. Cook with the lid on until the potatoes become tender. In a blender cup grind the cashews into a powder. Add the potato, broth and onion mixture, yeast, all of the spices, and the lime juice. Blend until smooth. If more liquid is needed, add water or broth, 1 tablespoon at a time until a smooth sauce forms. Depending on the saltiness of your broth, add more salt as desired. Spread the corn chips on a baking sheet. On top of the chips place the beans, corn, chilies,cheese sauce, and Sunshine Burger crumbles. Put the baking sheet in the oven and bake for 10 minutes. Remove from the oven and let cool for several minutes, then transfer to a serving dish. Top the nachos with the avocado, cilantro, and salsa and serve. 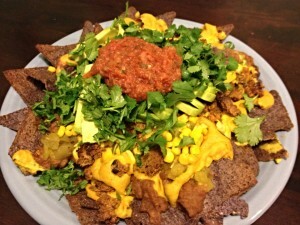 This recipe makes extra chili lime cheese sauce, so feel free to add more sauce to the nachos if you like your nachos extra saucy. Or use the extra sauce to create another big game snack – raw veggies with dipping sauce! This entry was posted in Dinner Recipes, Uncategorized, Vegan Recipes and tagged 1000 Vegan Recipes, big game, cashews, chilies, cilantro, corn chips, game day snacks, healthy snacks, nachos, nutritional yeast, refried beans, Robin Robertson, Southwest Sunshine Burgers, vegan game day snacks, vegan snacks. Bookmark the permalink.